Hi Friends! I hope you all had a fabulous 4th of July weekend. Can you believe today is already Thursday? I mean, it’s pretty awesome that the week is almost over. But I also feel totally behind and out of whack. The whole Tuesday Holiday thing has really messed with my brain (and my schedule). But I can’t complain. Because my weekend was really flipping awesome. Most weekends, I tend to work way more than I should. It’s super hard for me to let go of my responsibilities (even my fictitious responsibilities) and relax. But this weekend, I said “screw it” and I completely soaked in all the glory that is Summer. I went boating, had a pool party, went to a cook-out, ate s’mores, drank beers, listened to live music, had a girl’s night and just generally had a blast. I’m tired. And I have a lot of catching up to do now. But it was completely worth it. I also did a lot of cooking and baking (for aforementioned parties and cook-outs). So this week, I’m taking it easy in the kitchen. 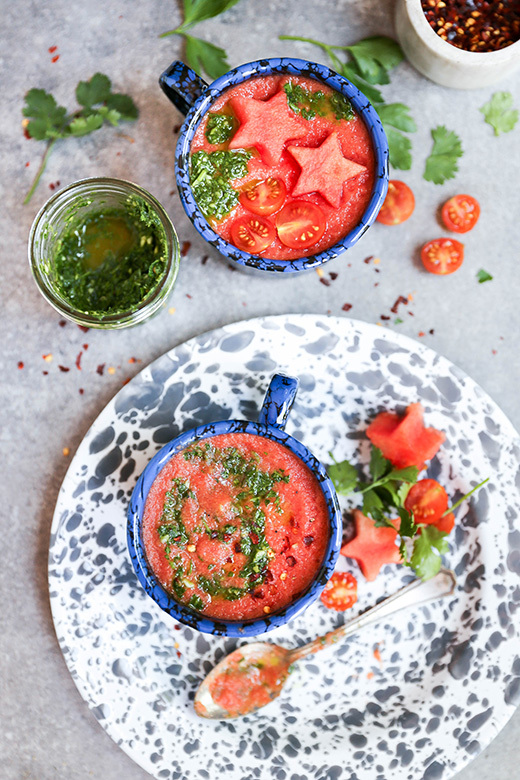 Which means this Watermelon and Tomato Gazpacho with Chimichurri Sauce is on repeat. There aren’t many foods I can think of that are as quick to prepare as a chilled soup. Just trim and chop your produce. Then drop it all straight into your blender and push the button. Easy peasy. My house stays cool. And so do I. That’s a major win in my book. This recipe is loosely adapted from Ina Garten’s gazpacho recipe, which I used to make religiously each Summer. But now I prefer a smoother texture (I don’t want to feel like I’m eating salsa with a spoon! ), so I blend mine more thoroughly. And I’ve added in fresh watermelon to give it some sweet notes, all while really upping the hydration factor. The homemade chimichurri sauce makes great use of Summer’s bounty of fresh herbs. And it provides a necessary savory contrast to the sweetness in the gazpacho. Remember, this is suppose to be soup. Not a smoothie bowl. You can use any kind of tomatoes you like. Roma or plum tomatoes are what I gravitate towards most often, because they have fewer seeds than some other varieties. But it’s hard to resist those beautiful heirlooms this time of year. So use what you love and/or have on hand. 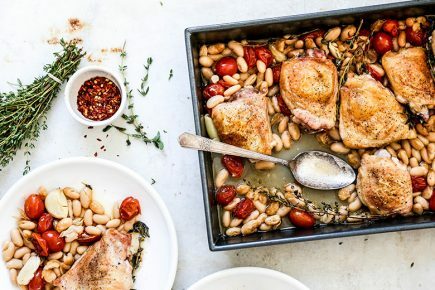 Also, don’t be afraid to play with the proportions in this recipe. If you want more zip, increase the amount of jalapeño pepper or red onion. If the soup seems too sweet to you, drizzle some vinegar on top before serving to cut the sweetness. It’s hard to go wrong here. Especially when all the Summer produce is so abundant and flavorful. It’s also fun to play with additional toppings. If you want something more hearty, try adding croutons, crumbled cheese, a spoonful of Greek yogurt, chopped nuts or some roasted chickpeas. 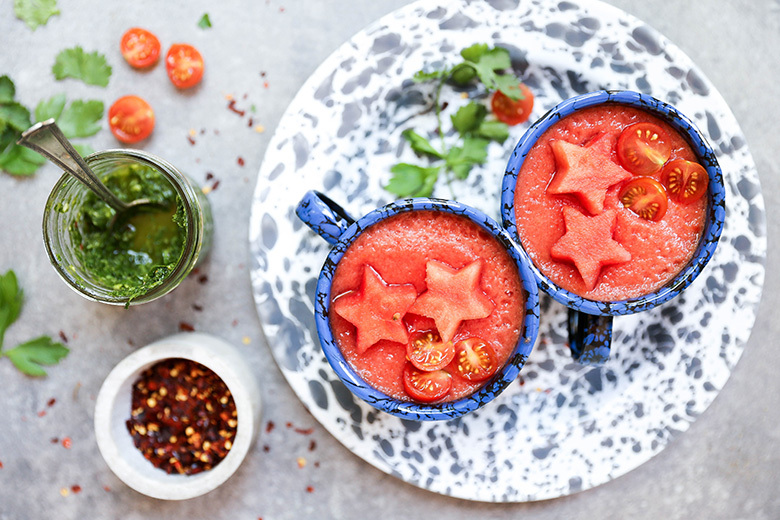 The watermelon stars are cute, but totally optional. 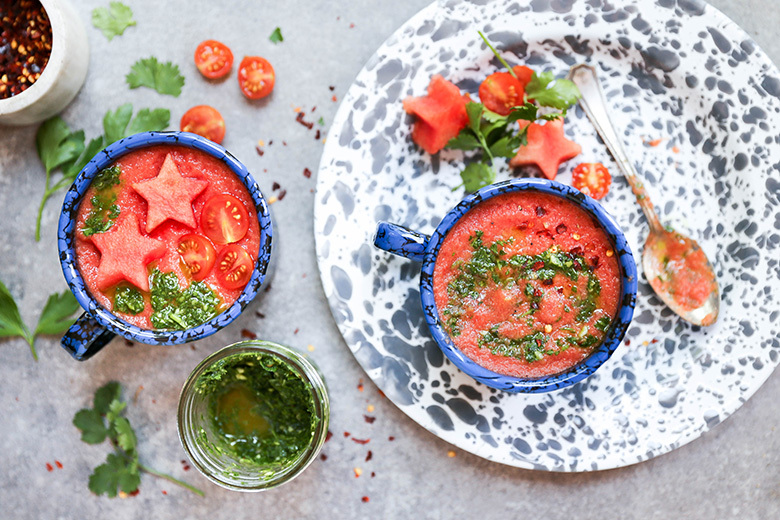 I’m sharing this Watermelon and Tomato Gazpacho with Chimichurri Sauce as part of our monthly 30 Minute Thursday series. 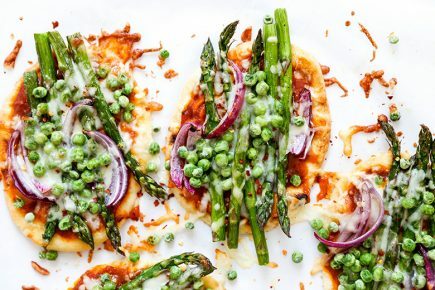 You can find more quick and easy recipe ideas below (just click the links!). Or check out the hashtag #30MinuteThursday on Instagram for additional inspiration. Because it’s way too nice out to be stuck inside cooking dinner! To make the chimichurri sauce, add all the ingredients except for the olive oil to the bowl of your food process fitted with the blade attachment. Pulse several times to combine. Stop to scrap down the sides of the bowl. Add about 2-3 tablespoons of the olive oil and process until just combined. You want a little bit of texture to the sauce, so don’t over process it. Add 1-2 tablespoons more olive oil if you prefer the sauce to have a slightly thinner consistency. Transfer the chimichurri sauce to a small bowl, cover and refrigerate it until you’re ready to use it. To make the gazpacho, add of the ingredients to your blender and blend on high until smooth. Taste and add additional salt and black pepper, if desired. Pour the gazpacho into a large container, cover and refrigerate it until well chilled. Before serving, give the gazpacho a quick stir as some of the liquid may have separated out. To serve, pour the chilled gazpacho into bowls. Swirl in a spoonful of the chimichurri sauce. Garnish with chopped tomatoes and watermelon, if desired. Serve immediately. I’m feeling totally out of whack this week too, but at least tomorrow is already Friday! I’ve never made gazpacho before, so I’m loving this watermelon version. Looks SO pretty! I hope you try it out, Gayle. It’s so easy! The chimichurri sauce is a great touch! But if you want even less prep, you could use a store bought pesto instead. Salsa with a spoon? SIGN ME UP. Seriously this whole week has me thrown off, so I think we need to make it the weekend again and start fresh on Monday, right? Your weekend/holiday sounded wonderful! I’ve said screw it most of this summer because I find myself working way too much and I need to let go more and enjoy. I’m never sorry when I do! 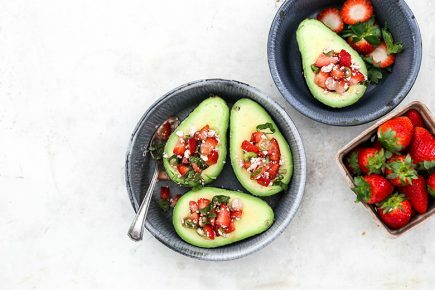 The watermelon-tomato combination sounds so delicious and topping this with chimichurri sounds so perfect. This is one refreshing meal! So refreshing on those hot days! 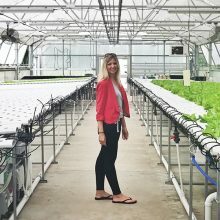 Glad you’re enjoying your Summer, Marcie! Summer goes by way too quick so I love that you got to enjoy the holiday weekend! 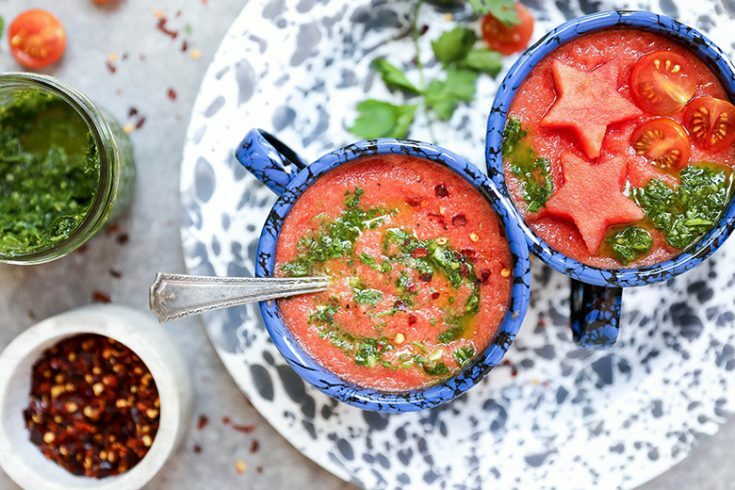 This watermelon gazpacho looks SO refreshing and beautiful! And I love the chimichurri sauce – I just want to put that on everything! The sauce is totally addicting! What a deliciously interesting gazpacho Liz. 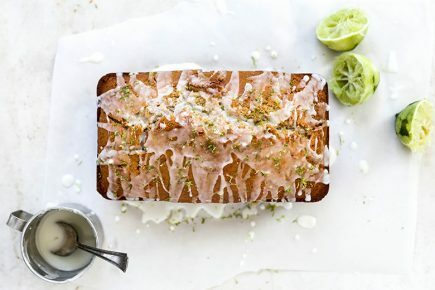 Such a creative summer recipe. Need to get this one on my list of must trys! I hope you try it, Mary Ann! Yes, I imagine you guys must be sweltering. Get yourself some chilled soup, girl! I’m glad you spent the weekend having fun and let the work wait until another day! It sounds like you made the most of it! 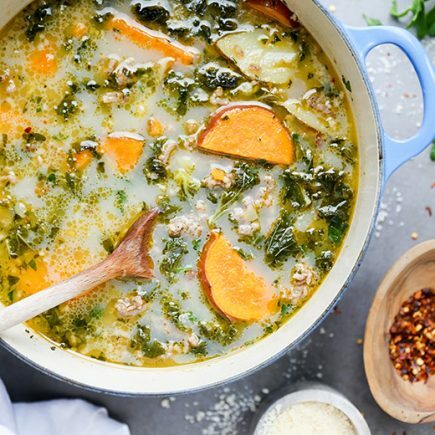 The sweet-savory flavors in this soup sound so good! I love that you made it with watermelon. Yeah, it was a much needed break. I need to remember to do that more often. Lol. Omgosh this is SO gorgeous and looks so refreshing! Thanks, Lexi. Perfect for the hot weather we’ve been having! i’m glad you got a nice break! yes i am guilty of working away on weekends too. But i’d break for this! ANY DAY! I gotta learn to be more chill on the weekends. Lol. Oooh, I love this combo! So many awesome summer flavors — very refreshing! 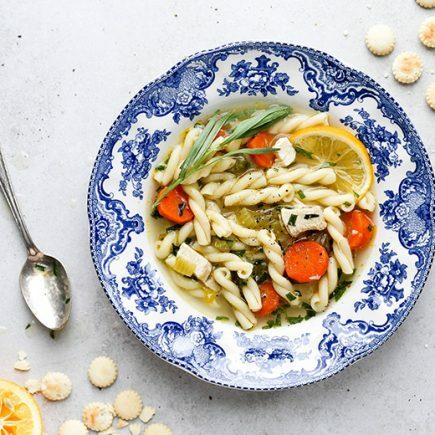 This soup is definitely one of the glories of summer! Liz, this soup is absolutely fabulous! I’m completely in love with the color, flavors and that chimichurri sauce! The contrast is simply gorgeous! Yay YOU for saying ‘screw it’! We need breaks… extended breaks. Frequently. Our lifestyles in the US demands so much of us and we have to push back. I love how you’ve done that and had such a great time relaxing and chilling out! Here’s to more of that this summer! Yes, I need to remember to give myself a break more often! I hope you try the soup, Traci. It’s a winner! We have a heat wave here and this is just made for such emergencies 🙂 Thank you so much ! 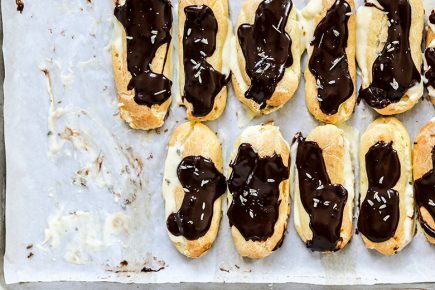 Yes, it’s way too hot to be slaving over the stove these days. Stay cool! Oh wow! 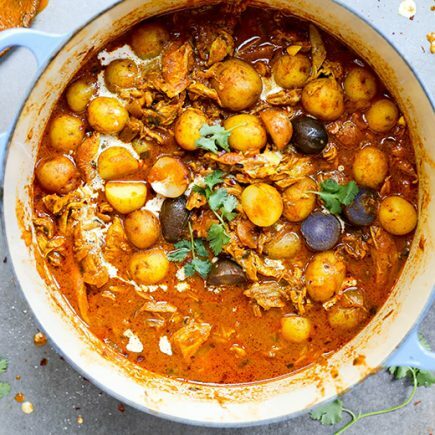 This soup is just gorgeous! I love the refreshing flavor of the watermelon the chimichurri! Thanks, Heather! 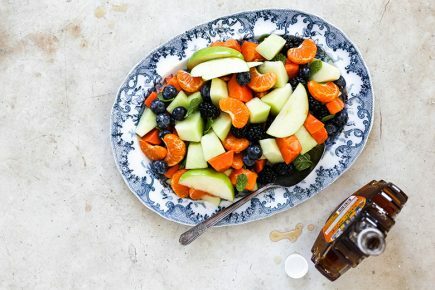 It’s totally Summer in a bowl! I love watermelon gazpacho in the summer! And those stars are so cute! It’s super cool and refreshing for Summer. And the stars are totally necessary! Lol.